This composite image, combining data from the Chandra X-ray Observatory and the Spitzer Space Telescope shows the molecular cloud Cepheus B, located in our Galaxy about 2,400 light years from the Earth. 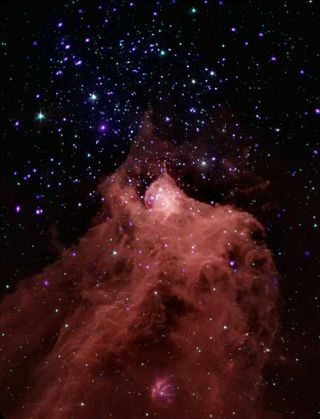 New photos of a cosmic cloud rich with young stars offertantalizing clues about how those stars came to be. Scientists recently combined images from the Chandra X-rayObservatory and the Spitzer Space Telescope to zoom in on the cosmic cloudCepheus B, located in our galaxy about 2,400 light years from Earth. This cloud of mostly hydrogen gas and dust contains a hostof bright young stars whose birth could have been triggered by a nearby massivestar outside the cloud. This star, called HD 217086, is bombarding the regionwith strong radiation. While this energetic flow is likely to have evaporatedthe cloud's outer layers, it also could have pushed a compression wave intothe cloud that may have drivenstar formation by increasing the density of gas in the cloud's interior. The new observations, which help astronomers estimate theages of many of the young stars, support this model of star formation. In the inner layer of Cepheus B, the scientists found mostof the stars are about 1 million years old, and about 70 or 80 percent of themhave "protoplanetary disks" of matter expected to be on their way to formingplanets - another sign of a young star. In the middle and outer layers of thecloud, stars are older (between 2 million to 5 million years old) and much lesslikely to have protoplanetary disks. If the massive star outside Cepheus B really did triggerstar formation insidethe cloud, scientists would expect just such an increase in stars' agesmoving farther away from the center of the cloud. The newborn stars resultingfrom the hot star's compression wave would be located in the cloud's center,but only aged stars would be likely near the outskirts, where the compressionwave passed long ago and the big star's strong radiation has squashed morerecent star formation. This trigger mechanism is just one example of how stars cancome to be. In other situations, stars commonly arise when gas cools andcondenses under its own gravity.